Memes, 🤖, and Wan: I ernie Wan Kenobi @Old Bern Kenobi ene b Bernie is the only person who can say anything he wants about arealDonald Trump and Trump never responds on twitter. 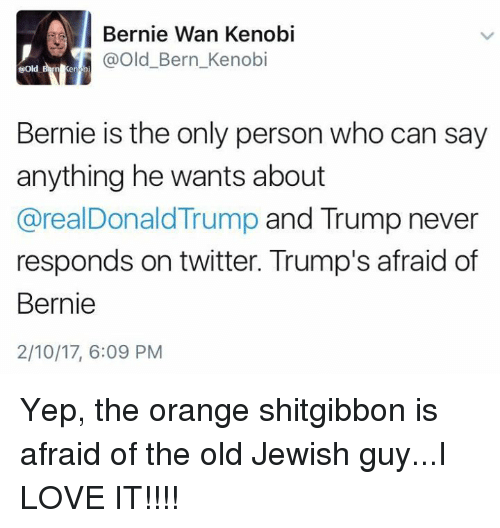 Trump's afraid of Bernie 2/10/17, 6:09 PM Yep, the orange shitgibbon is afraid of the old Jewish guy...I LOVE IT!!!! Yep, the orange shitgibbon is afraid of the old Jewish guy...I LOVE IT!!! !